Tonight on TNT Animal Kingdom airs with an all new back to back Tuesday, July 26 season 1 episode 8 called, “Man In” and we have your weekly Animal Kingdom recap and spoilers below. On tonight’s episode, Tensions soar as the Cody’s prepare for their big heist. On the last episode, Craig and Deran threw a party as Smurf handled unfinished business. Did you watch the episode? If you missed it we have a full and detailed Animal Kingdom recap, right here for you. 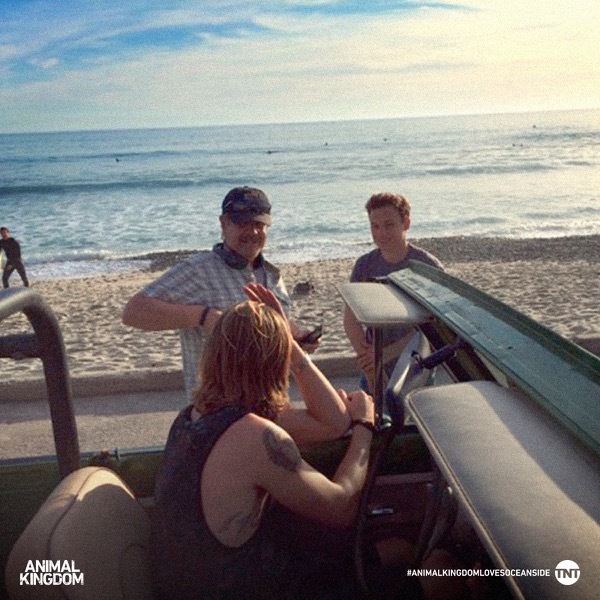 Tonight’s premiere episode of Animal Kingdom looks like it is going to be great and you won’t want to miss it, so be sure to tune in for our live Animal Kingdom recap at 9:00 PM EST! While you wait for our recap hit the comments and let us know how excited you are about season 1 episode 8 of Animal Kingdom. Paul Belmont managed to let the Cody family and in particular Baz rope him into their heist. Paul who was apparently a United States Navy Lieutenant Commander at Camp Pendleton had wanted to get back at his bosses who had overlooked him in the past and unfortunately Baz had offered him a great deal. He told Paul that if he helped them that he would be able to get a cut of the profits and frankly he also warned Paul that he had gone too far down the rabbit hole as it was what with accepting his offer to get his suitcase back. But Paul had surprisingly demanded that he should be part of the decision process so he eventually caused a few problems in the Cody family just when they didn’t need it. The Codys like any other organization had a hierarchy. Smurf was the one that ultimately okayed everything so even the smallest details had to be run passed her. However, Paul was changing that dynamic because he wanted a say as well and so he constantly interrupted Baz during a run through with for what they were going to be doing. Paul it seems had wanted things to be done his way so he had made several demands and had merely expected that they would be followed. So Baz had played nice and he also promised that no one was going to hurt nor were they going to be using guns yet that had been pure crap because he later assured Pope that they would do what necessary. And so it didn’t matter what Paul wanted. Paul had agreed to a plan without knowing who he was truly becoming involved with. His daughter Nicki on the other hand, had been smarter. Nicki had seen J with their teacher so she had jumped to the conclusion that the two were sleeping together and then oddly decided to follow what she thought was a betrayal by going to J’s house. J’s family had seen her on their security cameras so they had sent out Craig to deal with her because they didn’t want her dad to see her at the house. Yet, Craig’s idea on how to deal with her was to take her to the beach and there she might have confessed a little too much to him. Nicki had told him that J had left her for Alexa Anderson and that she thought her dad’s newfound friendship with Baz was possibly even stranger. Nicki had apparently caught on to the Codys and so she knew they were criminals, but didn’t seem to be all that concerned about her dad who she admitted wasn’t as bright as her. So Nicky had implied that she knew a lot more than they thought she did and that she wasn’t going to stop whatever was happening with her dad. Even if it might lead to him doing something illegal. Though she had truly been fortunate that she had told all of this Craig. Craig hadn’t seen what she said as a threat and had actually come to respect Nicki for being brighter than Paul so he hadn’t later told his family about the what he had discussed with Nicki. But while Nicki had unwilling granted the family her consent, J was getting dragged further into what the Codys were planning. J had been told by Alexa that she had been secretly wearing a wire during their conversations so he knew she was a criminal informant though he hadn’t said anything to his family because didn’t want to get hurt. J who still had something left of his humanity had been worried about what his family would possibly do if they knew so he had kept quiet on what he had been told and had also tried to distance himself from Alexa as a way to protect them both. So maybe it was because he had something to prove after that whole things with Alex that he allowed himself to agree to spy on the Naval Base. Someone had to go over there and disable the sprinklers so that the plan could work. So they had asked J to do it and sadly he hadn’t turned them down. J was after all one of the few people that the family knew that didn’t have a record so he was the perfect person to go by the base because it wouldn’t matter if he got caught. All the patrolmen would see was a teenager acting out and then let him go after they realized he couldn’t be a threat. However, J did what his family asked and he had gotten the job done without anyone being the wiser. And so after he did that for them, J had then tried to tell Baz about Alexa. He had asked to speak to Baz alone and had tried to work up the courage although at the last minute he ended up changing his mind and instead ask Baz if he was his father. Yet, Baz wasn’t in the mood for that question or where that might have come from so he chose to be a jerk to J. He told J that he could be his father and that it wasn’t important if he was. He said that it was too later for any of that bonding bull because J was practically a man now and so he told J not to expect anything from him. And then left J to deal with the fact that his possible father didn’t want to have anything to do with him outside of what they call “work”. Baz though wasn’t as detached about everything as he let on. Baz had apparently been going through a number of things like Catherine asking him about her parents and how lucky she had been that Baz had asked her to sneak out on the very same night that her house caught on fire. So he had a sneaking suspicion that she knew what happened that night yet he also had to deal with paying of Pope’s friend from prison as well as confronting his own dad about the way he grew up. Although it seems that Baz should have been paying attention to what Catherine had been saying because someone had told her what happened to her parents and that had made her want to run with their daughter. Catherine had almost instantly begun packing after Baz left for his latest “job” because she had a rather enlightening conversation with Det. Sandra Yates. The detective had told her that Smurf had ordered her parents be killed and that it had been Pope that had been seen not far from the crime scene on the night of. So Catherine had pieced together the rest and she had known that her daughter’s father had been in on her parents’ death. But that didn’t mean that she wanted to turn them in so she had packed up her stuff and was collecting as much money as she could to get away from them. J on the other hand, had talked to Nicki and Nicki had told him that she wasn’t going to say anything to her father or follow his advice because she had slept with his uncle Craig. So she might have been saying that just to get a rise out of him and who knows she could have been telling the truth, but either way, J ended up going over to Alex’s because he finally realized his family used everyone before spitting them out. He mentioned Nicki and he mentioned his mother so J was in the right kind of mood to turn state’s evidence. And next week we’ll see what he decided to do about his family.